VGo fills the gap between going to a particular facility in person and doing a video call with remote people in a conference room or office. In fact, VGo is the result of videoconferencing industry veterans who constantly heard from customers that a solution that delivered remote controlled mobility was needed. Videoconferencing / telepresence is typically deployed in offices and designated conference rooms – they are not located everywhere in a facility where you need to go to do what’s required. Customized roll-about carts are available but they are extremely expensive due to designs that target very specialized needs. There are no solutions for a remote person to cost effectively sit with a patient, visit the lab, attend school, or inspect the manufacturing line. While it’s great to be seen lifesize on a huge plasma display, after the formal meeting, remote participants miss out on the continuing conversations and seeing things outside the conference room – in the hall, around the watercooler, in lab, etc - because they are stuck on the wall. The biggest difference is the personal independence that you get with the VGo solution. You arrive when you want and go where you want. A room doesn’t need to be scheduled and people don’t need to be available at a specific time. No one needs to tend to you. 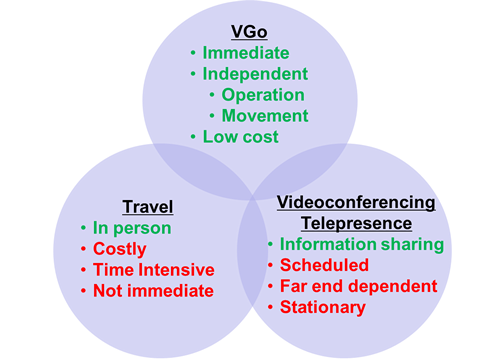 A video call requires at least two people - VGo just requires you. In fact, VGos are often used effectively by people who find that it’s hard to get schedule commitments or even phone calls returned. A person always had to be available to carry the laptop and ensure that the camera was pointed correctly as required by the remote person. That sounds easy but invariably the remote person always found they weren’t where they wanted to be since its nearly impossible to have someone devoted 100% tending to the laptop. And having someone responsible was a burden and often costly. VGo doesn’t require any assistance. changed a setting or selected the wrong option or pressed the wrong key so it was never something that could be counted on working without a lot of attention by a trained specialist. VGo is a dedicated appliance so it’s always ready. There are other robotic telepresence solutions out there but since VGo has become available - all organizations choose VGo. Best physical design - VGo turns heads wherever it goes, it's friendly shape and high quality white plastic doesn't look like a "robot"
Want to get more detailed information? Click Here.